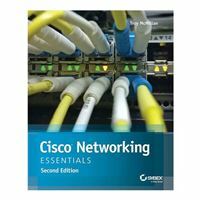 Cisco Networking Essentials, 2nd Edition provides the latest for those beginning a career in networking. This book provides the fundamentals of networking and leads you through the concepts, processes, and skills you need to master fundamental networking concepts. Thinking of taking the CCENT Cisco Certified Entry Networking Technician ICND1 Exam 100-101? This book has you covered! With coverage of important topics and objectives, each chapter outlines main points and provides clear, engaging discussion that will give you a sound understanding of core topics and concepts. End-of-chapter review questions and suggested labs help reinforce what you've learned, and show you where you may need to backtrack and brush up before exam day.